Leonardo’s M-345 trainer jet is in static display at the Dubai Airshow, one of the most important global defence and aerospace events, held from 12 to 16 November. The Aermacchi M-345 is the latest military pilot trainer aircraft developed by Leonardo's Aircraft Division. Aimed at the basic-advanced phases of the training syllabus, it will offer low acquisition and operating costs. The programme was officially launched in June 2013 and, moreover, it is intended to replacethe current Italian Air Force MB.339A fleet, also re-equipping its famous “Frecce Tricolori” aerobatic team. 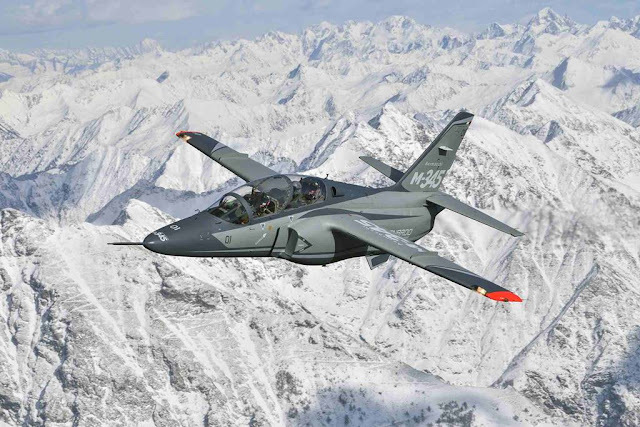 The new M-345 aims to offer the superior performance and training effectiveness typical of a jet aircraft at costs comparable to high-powered turboprop trainers. Thanks to its modern avionics, considerable external load-carrying capability and performance, the M-345 HET is also suited for operational roles. Life cycle cost reduction is driven by long fatigue life and two-level maintenance, the latter made possible by the Health and Usage Monitoring System (HUMS) that will eliminate the expensive general overhauls. Avionics are based on the latest M-346 Advanced Jet Trainer experience and match the standards of the latest combat jets, including HOTAS controls, Head-Up Displays (HUD), Multi-Function Displays (MFD), the real-time datalink and the Embedded Tactical Training Simulation system resident on boardthe aircraft. The aircraft is powered by a high efficient Williams FJ44-4M-34 turbofan in the 1,540 kg / 3,400 lbs. maximum thrust range. The airframe has +7/-3,5 g limit load factors. Operating efficiency is ensured by single-point pressure refueling and on-board oxygen generation (OBOGS), both of which reduce the need of ground support crews and turnaround times.